Harran is a total slap in the face. All the survivors, be they bully or prey, feel the same moist press of zombie flesh smacking against their collective cheeks. Nobody is comfortable in the city, cramped and confined and limited to stacks of tables and boxes to navigate the corpse strewn streets, so undoubtedly all survivors have some stake in getting the hell out of the city and out into the sweet, pristine countryside. Now, in a tower garrison held by a benevolent group of survivors, a near dead newcomer has brought with him a map that seems to indicate the unthinkable: there is a way out of the city, and it leads to a people who’ve found the secret to avoiding zombie infection. In Dying Light: The Following, you crawl out from the cramped walls of Harran and try to find answers in the open countryside surrounding the city proper. Dying Light is a pretty fantastic gaming experience, and quite large as well. The Following is a lengthy expansion on the main story, and takes place on a considerably larger map representing outer Harran. Further expansions of the player’s capabilities as well as the actual mechanics of the game itself give The Following a deeper immersive feeling, and provide more than just extra space and side quests. The most evident and crucial of these updates is the ability to drive a buggy vehicle around the map. Found early in the expansion, this vehicle is quick and agile, but takes damage quickly and leaves you prone to attacks from all sides. The buggy can be used for certain missions to get around quickly and is also central to a few for completion, but it is mostly optional like a lot of other features in this game tend to be. The buggy is upgradeable through leveled parts, equipment upgrades, and there is also a new skill tree devoted to driving that can expand your capabilities as well. As you level the vehicle the improvements in speed, handling, braking, and other areas is drastic and rewarding. The vehicle does require constant maintenance just like the weapons do, and the parts have limited repair numbers before they are rendered unusable. If you’ve played the original Dying Light at any decent length, you’ll find yourself becoming skittish and overly cautious when not in your vehicle much like that “brand new player” feeling when you first get out into the streets on foot. This addition makes The Following feel even more like an entirely different game, and the map in which the story takes place is brilliantly designed to accommodate both the new need for driving and open space, but also the parkour and on-foot evasive elements as well. The map for the Following is very big, quite a bit larger than the original map for the city of Harran. There are several distinct zones to visit with coastal areas, a introductory bog, some richly populated farmlands, mountainside attractions, and even suburban slums with a few upper lower class zombies milling about. With a map this size one can expect some monotonous open space, and there are patches of land where nothing is happening except flat grass flickering in the diseased afternoon breeze. Secondly, you can expect instances where the clipping, surfaces, or other graphical assets are missing, and rarely you may find a few of those mistakes as well. Neither issue is particularly damning to the overall product. The Following does present additional story that takes place after the main story has unfolded. You do not need to have beaten the game to enjoy The Following, and are free to start it right after the prologue. Be forewarned that this will mean certain and often unrelenting death, as the enemies in the countryside are bigger, meaner, faster, and more firepower friendly than those living with the dense zombie conditions of the city proper. A little patience to start with the main game can pay off for a little more survivability down the line with this expansion. The story is about as compelling and cohesive as you’d expect a sequel to be, but it’s certainly not trivial or nonsensical in any way. You are trying to gather intel on the abilities of these survivors who cannot become infected, and to do so you complete tasks for the people to gain their trust. Rather than playing out over several main quests, the Following actually has a unique focus on the side quests, having you complete those as a requirement for the main story to proceed, rather than as a supplement to it. There are sometimes issues with the way the game treats death, progression, and high importance missions. Early in the expansion, you are tasked with using your buggy to run down a leak as fast as you can and open a valve before the pressure bursts all of the pipes in the area. If you fail, you start over with the timer counting down and are unable to switch to another mission. You are fully healed each time you “resurrect”, but your buggy retains all damage. This is a nighttime mission, which means that special “volatile” enemies that are stronger, faster, and more numerous. As your vehicle incurs more damage, it gets slower and slower, which means instant death from these attacks. Each time you die or the timer runs out, you fail again, and to stop and try to repair your buggy at night also results in death. The only way to beat the mission (besides getting it in the first go) is to simply lose and die over and over and over until the game finally passes through to the day time. It’s beyond frustrating to be set up to lose and not be given the ability to refresh both you and the vehicle. Luckily, this is not a common occurrence and it’s not so much a bug or a glitch as it is just merciless game mechanics. It certainly could have been planned better. 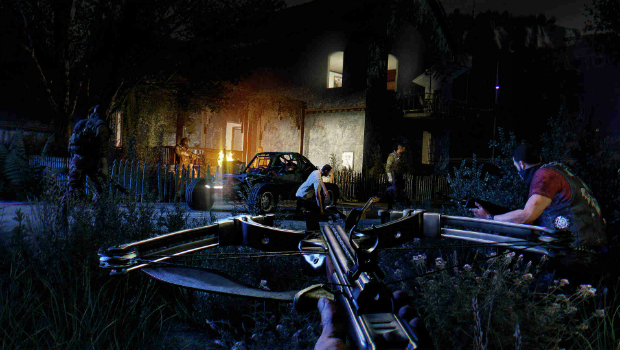 Besides the buggy and the map, The Following provides the player with a litany of new weapons and guns, a brand new crossbow weapon, numerous new outfits and vehicle skins, as well as a lot of new individual random encounters and more ways to scavenge for parts and items with the expansion of vehicles as containers. More is almost always better, and the actual new item, the crossbow, works beautifully and adds a powerful go between for the silent bow and the deadly but loud firearm.